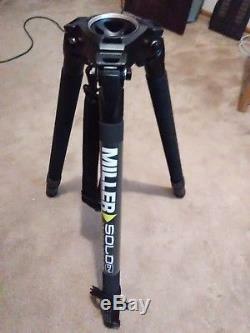 This item for sale is a Miller Solo DV (2-stage) Carbon Fiber Tripod (Tripod only)- (NOT A DS-10). 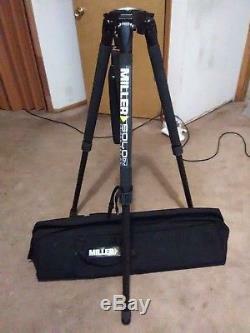 The tripod is Lightly used and in excellent "like-new" condition. 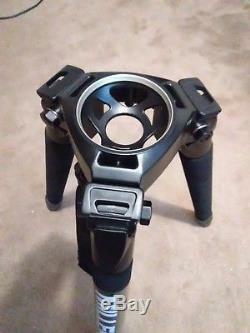 Carbon fiber spreaderless tripod, is designed for the single operator cameraman, providing ultra light, rock solid stability for an unbeatable low price. The Solo sets up quickly and securely to maximum 63" height and pack down to a compact 27" for transport and hitting a low of 8 for low angle shots. Selectable leg angle locks ensure rapid stabilization, while the 75mm diecast alloy bowl offers quick leveling, optimum torsional rigidity and long term durability. Carbon fiber construction- telescope extension legs up to 63 in height. 75mm / 3 bowl base. Concentric leg angle locks ensure rapid stabilization at any height and are independently adjustable. Maximum height of 63.5-inch. Supports up to 44.0 l b. 37.0 x 13.0 x 11.0. 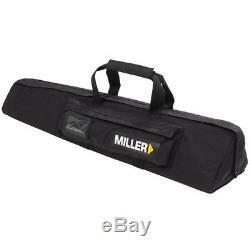 The item "Miller Solo DV Carbon Fiber Tripod (63) (Tripod, softcase, no head)" is in sale since Saturday, July 7, 2018. This item is in the category "Cameras & Photo\Tripods & Supports\Tripods & Monopods". The seller is "mil4547" and is located in Littleton, Colorado.